ZigZag offers tailor made snowshoe adventures led by our vibrant French, English and Dutch speaking guides. We offer custom-made private experiences designed especially to fit your group’s preferences. Simply contact us with an idea of the snowshoe outing you have in mind and we’ll help you create a superb winter experience adapted to suit your goals and level of fitness. Snowshoeing is a real escape. Far from the pistes, you’ll discover utterly magical, Narnia-like landscapes. Snowshoe walks make snowy winter terrain accessible to anyone and everyone. Whether you take a half or full day to conquer a summit, stroll through the woods, or build an igloo as a family, there’s an excursion to suit your needs. The Haut-Giffre valley offers a range of extraordinary walking itineraries. Take a guided walk in the company of a professional in order to find the most beautiful paths and enjoy the most spectacular views over the Mont Blanc range. Your guide will show you tracks left by mountain animals such as chamois and bouquetins in the glorious Sixt Fer-à-Cheval national reserve. Whatever your level of fitness, there’s a route to suit you. 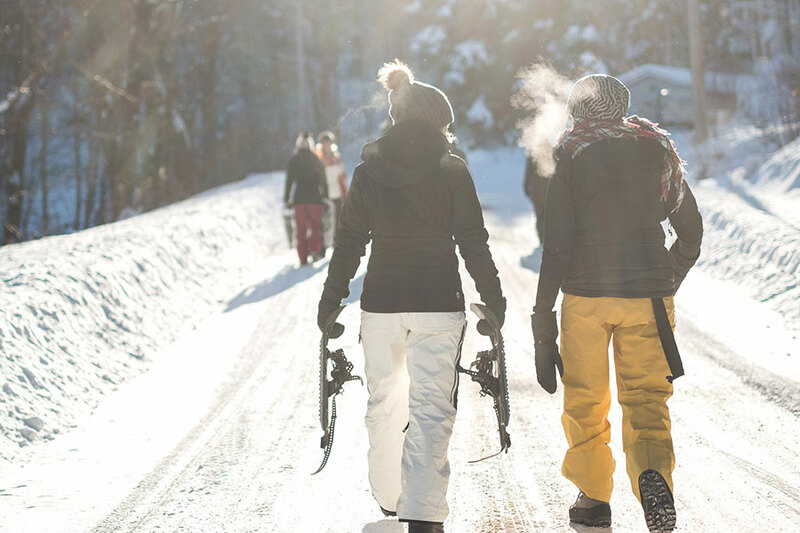 A half day walk takes about 3 hours in total and is a perfect introduction to snowshoeing. A morning outing begins at 09h15 at the ZigZag office (or another agreed location) and participants can expect to be back in Samoëns village at around 12h15. An afternoon outing begins at 13h15 at the ZigZag office (or another agreed location) and participants can expect to be back in Samoëns village at around 16h15. A lovely walk through the forest and along alpine pastures at an altitude of about 1300m. This walk has a lovely sunny exposition gives you great views on the Giffre Valley. If the weather is clear, you’ll see majestic Mont Blanc in all her glory! A great South-facing walk with stunning views over the Mont Blanc range and the Giffre Valley. We will walk on an altitude of about 1700m in spectacular open terrain near the famous Joux Plane nordic ski area. When the weather is clear you’ll see loads of parapenters taking off and soaring overhead. This tourist-magnet in the summer is a also a magnificent snowshoe spot in the winter. Encircled by awe-inspiring, 3000m high cliffs, we find our way through pristine alpine forests, spotting wildlife tracks and enjoying the breathtakingly wild landscape. This walk takes place at around 900m altitude and is largely over flat terrain. If conditions are right, you might even witness impressive avalanches falling from high cliff faces in the distance! A full day walk takes about 8 hours in total (although don’t worry you won’t be walking the whole time!). A full day of snowshoeing meets at 09h15 at the ZigZag office (or another agreed location) and participants can expect to be back in Samoëns village at around 17h00. A short 30 minute drive from Samoëns you’ll unveil the unspoilt Foron Valley. Filled with wildlife and surrounded by impressive peaks, you guide will lead you through untouched landscapes to enjoy lunch at a mountain restaurant or to picnic on a mountain peak. Your guide will drive you to a hidden carpark just half an hour from Samoëns, from where you’ll climb up the hill until you reach a rustic alpine refuge with an amazing restaurant and stunning views on Mont Blanc. Here you’ll enjoy a proper Savoyard lunch “à la française” (which means that we take our time to enjoy our meal and a glass of wine!). On the way back down you’ll walk, run and slide down through the forest, making your own tracks amongst those left by all sorts of other local wildlife! The hike to Bostan is a slightly more demanding walk covering about 600m of vertical altitude, crossing forests and open fields as you enter higher alpine terrain. When you reach the top you can enjoy a picnic lunch or a hot meal at the Refuge de Bostan (when it is open). If you’re moderately fit and like a bit of a challenge, this snowshoeing experience will really hit the spot! Our guide will help you construct your very own genuine igloo (or quinzee). An excellent team building activity ideal for families, friends or corporate groups, igloo building is hard work, but offers great pleasure and reward. When your igloo is finished you’ll enjoy a well-earned hot drink under your snowy roof. Our guide can come to the garden of your property, or take you to his secret spots to built your snowy shelter. Ideally this is a full day activity, but a small igloo can be achieved in a minimum 4 hours. Our guide will take you to an area with fresh snow to explain some basic principles of snow composition, the way snowfalls and temperature affect snow stability, and some of the dangers to be aware of when exploring back-country terrain. The main content of a snow safety course entails instruction in regard to the proper use of an avalanche transceiver, probe and shovel. Consider this course a basic introduction to snow safety – it will not prepare you to explore the off-piste on your own, but is a great way to better understand conditions when you go off piste with one of our guides. The snow safety course is a half day activity, with a minimum of 4pers required. Departing from the ZigZag office at 12h30, your guide will drive you to the end of the road at 1200m. Here we clip on our snowshoes and start our 24 hour adventure! Throughout the afternoon you’ll gently climb 650m upwards through the forests to reach a remote alpine hut. After enjoying the sunset with a drink in hand, we’ll prepare a hearty dinner together. You’ll spent the night in a dormitory but alas, there will be no shower. After a continental breakfast, we’ll descend back to Samoëns for a late lunchtime arrival.